Grammar exercises, vocabulary tests and pronunciation drills are all very well, but at some stage our learners are going to be out in the real world, calling upon the knowledge and skills they have learned in class to navigate a host of everyday situations, using English to explain, persuade, justify, cajole, describe, discuss and even argue. One of the most engaging ways to give learners the opportunity to practice such English is, of course, to have them act out real-life situations. Why not get your students really working with the language with these 4 great EFL role plays? Student A, nearly 18, is in the final year of high school. This Saturday, Jack Streamer, one of the most popular kids in school, is throwing a party at his place. His parents are going to be away and absolutely everybody is going to be there. There’s no way Student A can miss it! The problem is, s/he has to get mum or dad’s permission to go, and the likelihood is they’re going to be reluctant. Nevertheless, Student A has been working so hard at school lately that it’s time to let their hair down. Besides, everyone will think they’re really uncool if they fail to show up. Student B, playing mum or dad, is very much set against letting their son or daughter attend the party in question. Rumour has it that the last time this Jack guy threw a party, the police were called. Heaven only knows what for! Besides, the son or daughter has important exams coming up. Now is not the time for partying. Both parent and child are stubborn. Who will give in first? Will they reach a compromise? Will the whole thing stay amicable or will someone with attitude get sent to their room? Useful input language: first conditionals for promises, threats and consequences, the language of persuasion. Students work in groups of three for this role play. They play three friends, one of whom – let’s call him Billy – is terribly indecisive and always needs to ask the advice of the other two before making a decision. The other two play the angelic friend and the devilish friend, the former giving all kinds of measured, sensible advice, the latter throwing caution to the wind completely. Billy has a series of decisions to make as he goes through life, and at each juncture he turns to his two friends to ask them what to do. 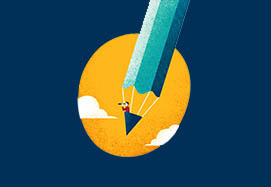 You can prepare the decisions in advance, or ask students to improvise them, but here’s one to get the ball rolling; Billy has just graduated from university and has been made a fantastic job offer: superb conditions, excellent salary, secure future, but lots of hard work, huge responsibility and days spent in front of a computer at a desk in an office. At the same time, he has just won an around-the-world air ticket that will let him travel with a friend and see the world for a year, stopping off at five different continents on the way. If he takes the job, he loses the ticket. If he goes travelling, he loses the job… What should Billy do? Useful input language: If I were you…, first and second conditionals for advice, warnings and recommendations. In this role play students act out an encounter between teachers and parents at the school’s annual parents’ evening, where the progress of individual students is discussed. Before the main role play, divide the class into two groups, the teachers and the parents. The teachers are on break in the staffroom, discussing their students. Everyone is convinced that they have the rudest, laziest, most badly-behaved and mendacious kid in school. They should come up with lots of examples of the appalling behaviour of the student in question. Meanwhile, the parents are having lunch together, trying their hardest to outdo one another as to who has the most perfect, most popular, most well-behaved and charming little prince or princess. They should come up with lots of examples of the excellent behaviour of the child in question. Useful input language: phrases for hedging, polite language, language of disagreement. Ben and Sally are totally, utterly head-over-hills in love. Ben lives in North Town, Sally in South Town. 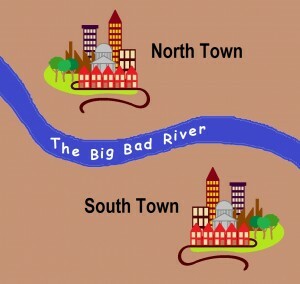 They can’t move towns because of family and work commitments.The problem for their relationship is that the two towns are separated by the Big Bad River. There are no bridges across this river, and no tunnels under it, plus the current is strong and the water is infested with nasty crocodiles. The only time they get to meet is at the weekend; there’s a ferry service on Friday and Sunday evenings. Once a week Ben takes the ferry to South Two and spends the weekend with Sally. Amongst the many things that lovers do when they get together, they always end up talking about their relationship, and the problem that confronts them, namely the fact that they live on opposite sides of the river and cannot always be together. This conversation constitutes the first part of the role play, with one student playing Ben and the other Sally. Weeks and months go by, and without fail, regular as clockwork, Ben arrives on Friday and stays until Sunday evening. But then mysteriously, one particular Friday night, he fails to show up. What could have happened? Is anything wrong? Desperately worried, Sally goes to consult her friend, Gretchen, about what to do, but Gretchen rarely has a good word to say about anyone. There’s no doubt in Gretchen’s mind that Ben is up to no good. The second part of the role play is the conversation between Sally and Gretchen as Sally, who believes the best of her boyfriend and would trust him with her life, tries to think what might be wrong, while Gretchen is quick to plant all manner of unsavoury ideas in her friend’s mind. After the conversation with Gretchen, Sally decides that she cannot possibly wait until Sunday, when the ferry is next due, to discover what has happened to Ben. Her only chance of finding out is to somehow get across the river to North Town herself. The only thing she can think to do is to ask for help from local lothario, Tom, who has a reputation as a rather unpleasant womaniser but who at least, in his favour, has a motorboat that could get her across the river… The third part of the role play is the conversation between these two. Beyond the third stage, it works well to let the students run with their own ideas and come up with their own endings, then report them back to class. Prepare yourself for comedy, tragedy and even horror, depending on the story-telling tastes of the members of the class. This entry was posted in Ideas for Class, Teaching Adults, Teaching Teens and tagged EFL, ELT, Ideas for class, Pearson, Role play by Daniel Vincent. Bookmark the permalink.